I’m pretty sure that Teanna of Spork or Foon picked this week’s recipe because it has the strangest name out of all the recipes in Baking: From My Home to Yours. I’ll be checking her blog to read her explanation of why she picked this recipe. You should take a look too, because Teanna’s blog is really fun! She has a great sense of humor, and so much energy that sometimes I get tired after reading one of her posts! The short story on this recipe is that scherben means shard in German, and Mrs. Vogel is the woman who gave Dorie the recipe. These are strips of dough that are fried and then dusted in both cinnamon sugar and powdered sugar (aka confectioner’s sugar or icing sugar). 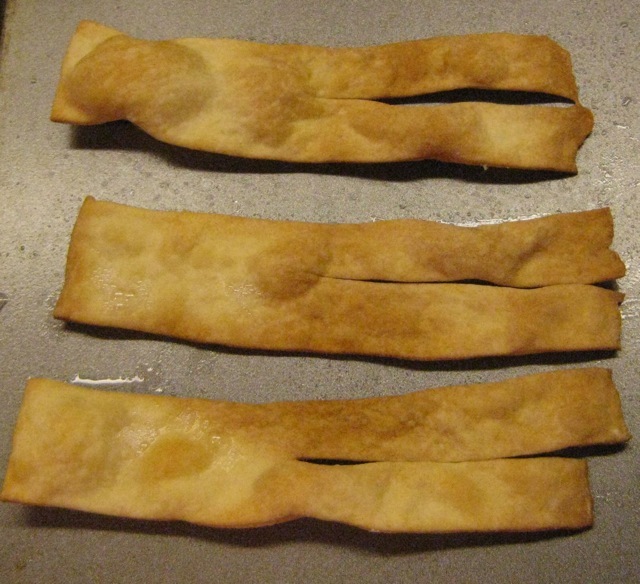 In the book, Dorie explains that this type of treat is universal: in France they call them bugnes, in Switzerland they are merveilles, and in America, fried dough. Yes, good old fried dough! This is the kind of thing I would expect to find at the state fair. What I did: Thanks to Caitlin, I decided to bake these. She tried it first and had good results, which she posted in our P&Q (problems and questions) forum on the Tuesdays with Dorie site. Following her instructions, I brushed them with oil and baked them at 400º for about 10 minutes. I tossed them in cinnamon sugar immediately when they came out of the oven, and then dusted with powdered sugar after they had cooled. I baked one pan of them the day I made the dough and baked another pan of them the next day and both batches worked well. How it went: The dough was easy to mix and roll out. They browned and puffed nicely in the oven. My main reason for not wanting to deep fry is the mess and the smell. I have a “thing” about it and that’s just how it is. Would I make this again? : I doubt it, but I will say that they were fun to make and eat, and I’m glad I didn’t pass this one up! If you’d like the recipe, take a look at today’s post on Spork or Foon, or look on page 157 of Baking: From My Home to Yours. These look so nice and puffy! Weren’t these just the best “baked”? Glad you enjoyed them – I almost passed them up to. So glad I didn’t! Ciao !! Here you can buy them fried or baked but I wanted the full sin !! Love yours ! Hahahaha you know you are exactly right. When I picked them out of the book, it was because I had no idea what they were and I knew NO ONE would have picked these! Haha! Yours look absolutely delicious! Thanks so much for frying along with me this week! Thank you so much Jill, for keeping up with me while I was away… I can always count on you! Baking is such a great save for this recipe! I wish I’d tried it too. I only used 1″ of oil and they fried up nicely with not too much stink. Well, at least you can cross it off your list, right? I did a rewind recipe instead this week. Glad they worked for you- so fun. I’m feeling sorry for my self that mine didn’t work out! I have a thing about the fried food smell too but I fried anyway. Luckily it wasn’t too smelly. Good to know the baking works but I don’t think I’ll be making these again either. They look perfect. I love how yours turned out! What a great idea to bake them!!!!! I too can’t stand the “deep fried” smell the house has after I fry anything. Which is why I usually do it outside! These turned out well Jill. 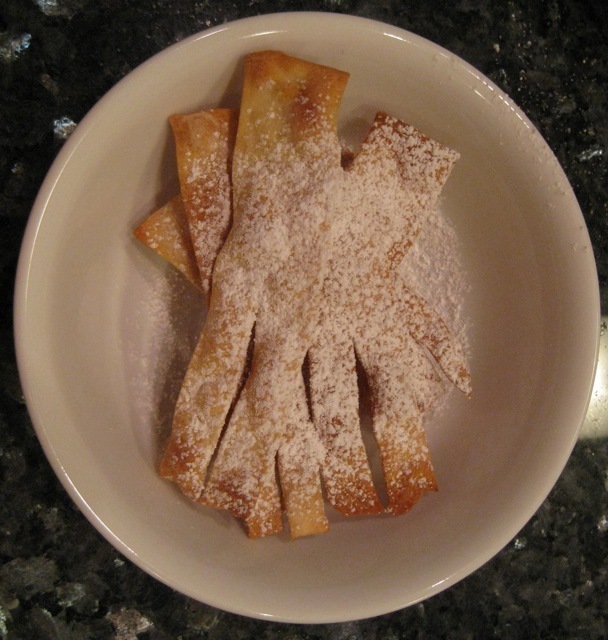 I decided to take the plunge and fry – after making cannoli for Daring Bakers, I am fearless (well – almost). Based on looks, I honestly cannot tell that you didn’t fry them. I’m with you on the repeat performance idea. Fun and easy. Look just right. Your scherben turned out fantastic! I’m glad that baking them worked out so well. They looked good baked, too, especially with all that sugar powdered on their little selves! I think you should make them again, maybe just a wee recipe, and fry them b/c they are really good fried (as a treat for just once and again in a blue moon). I will try them baked so I can see how they compare…there is just something about those blistery pockets of air that crunch that special way when you fry them. I’ll send Matt over to help you eat the leftovers. The baked ones turned out beautifully. You’re right, this was something new and fun to try. I’m glad to hear that baking them was successful! You were very brave to try baking yours. I think they look great! !